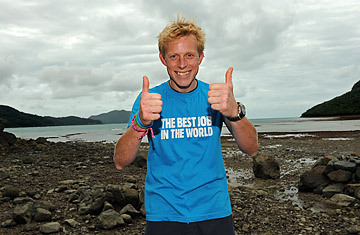 Ben Southall of the UK gives the 'thumbs up' after he was declared the winner of the 'Best Job In The World' competition on Hamilton Island in the Whitsunday Islands. The candidate search has also given an undeniable boost to Australian tourism, which has gone into considerable decline amid the current economic recession. Indeed, Southall's role is part of a wider $1.2 million campaign to publicize northeastern Queensland, which officials claim has already generated more than $75 million worth of publicity. The job itself requires Southall, a former project manager at an agricultural company, "to explore the islands of the Great Barrier Reef, swim, and snorkel, make friends with the locals and generally enjoy the tropical Queensland climate and lifestyle." But before his position kicks in on July 1, he talked to TIME about this chance of a lifetime. How did you find out about the job and what did you do for your application video? I found out about the position from a good friend of my girlfriend's who cut out the article from one of the national newspapers. I'd just returned from my year traveling around Africa and had come back to a fairly dormant job market in the U.K. She said, " Ben, have a look. I think you've probably got what it takes to at least get through to the next round." We wrote a little script and headed out with a tiny compact camera and shot some footage of me jumping into a pond in the freezing cold. And I just tried to summarize what I'd done over the past few years and why I thought my application was suitable to get me through. Tell us about the process once you found out you'd been shortlisted. I found out while on holiday in Vancouver I'd got down to a final 50. From there, the 50 of us had tests to show we could promote Tourism Queensland because we'll be doing that as much as possible. We had a couple of days in London meeting the CEO of Hamilton Island and his workers where we had to demonstrate we could do this job to them. Then 16 of us were flown out to Australia to show that we could actually swim and snorkel. We had to document all this to prove we would be able to blog about it and could sell Tourism Queensland to the rest of the world. It sounds like a reality TV show. It has been but it's in a different light. It's not been about eliminating people one by one. It's an interview process as much as anything, which has been taken very seriously by the people carrying them out as opposed to being documented just on film. But there has been an internal crew as well as the BBC, who came over to make a documentary that will go out in the U.K. on July 2, the day after I start. Talk us through what your typical day will be like. There's lots on offer out here: big national parks, the entire Great Barrier Reef, 600 islands, 2,900 kilometers [1,800 miles] to explore. I'll see what I can discover and try to sell it to the rest of the world. What do your friends, family and colleagues make of the move? Mum and dad are over the moon. They'll be coming out here on holiday. I spoke to a good friend today who advised me to enjoy the next couple of days in Australia because the news is absolutely everywhere in the U.K. It will be overwhelming to walk into work next week and tell the boss that unfortunately I won't be coming back. But it's also an opportunity for friends and family to come over and do some of this as well. It's a huge house and myself and my girlfriend are going to rattle around in there so we need some people to fill it out. So you're not exactly going to be stranded on the island à la Tom Hanks in Castaway? Oh no, my girlfriend is looking forward to it! She's coming out for the full six months and friends and family can drop in as they see fit. My aim is for other people to be ambassadors for the Barrier Reef. What can you tell us about that salary? It's something that wasn't initially a driving force behind this. My life is about new challenges and opportunities. The salary on top of it is obviously fantastic to have and it will mean that I can continue to do my charity expeditions. In the past, they've all been African-based and I want to find some decent causes out here in Australia and try and give something back. And what career could possibly compete with this one? Do you harbor ambitions to do something even more extravagant upon your return? Or will you just want a cup of tea and your own bed? Yes, I think that'll be the first thing I'll want! But as I managed last year, when I did a complete lap of Africa, my plan would be to do something similar in Australia. it's a heck of a long distance to cover with not a lot of places in-between some of the big towns. I'd be raising money for charity. I also think I can do some more marathons, or climb some mountains or maybe circumnavigate the islands. So lots of ideas in the pipeline, it's just working out which are viable ones. I think over the next six months, I'm going to have time to do lots of research.